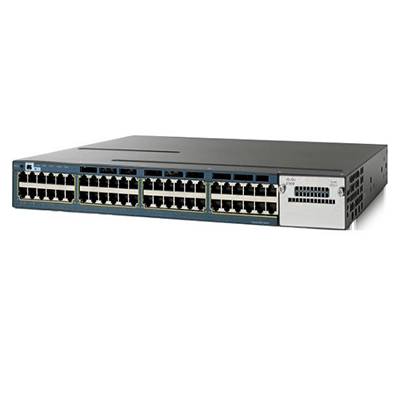 The CISCO CATALYST 3560G-48PS Series can be purchased with the IP Base or IP Services licenses pre-installed. The IP Base license offers advanced QoS, rate limiting, ACLs, and basic static and Routing Information Protocol (RIP) routing functions. The IP Services license provides a richer set of enterprise-class features, including advanced hardware-based IPv6 unicast and IPv6 Multicast routing as well as policy-based routing (PBR). 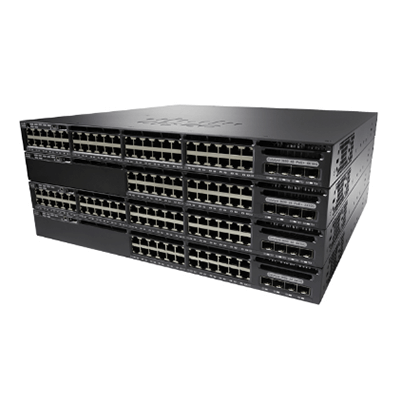 The IP Services license upgrades Cisco Catalyst 3560 Series switches to include IPv6 routing support. Upgrade licenses are available to upgrade a switch from the IP Base license to the IP Services license. 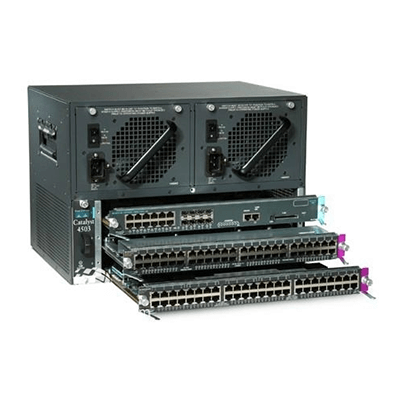 The SFP-based GE ports accommodate a range of SFP transceivers, including the Cisco 1000BASE-T, 1000BASE-SX, 1000BASE-LX, 1000BASE-ZX, and CWDM SFP transceivers. 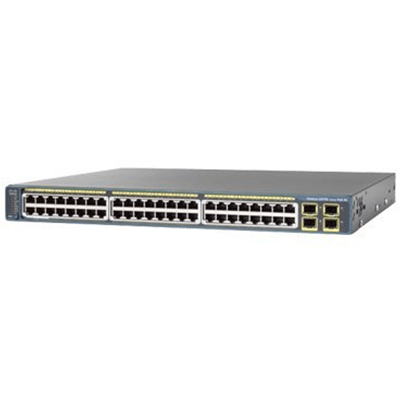 These ports also support the Cisco Catalyst 3560 SFP Interconnect Cable for establishing a low-cost Gigabit Ethernet point-to-point connection. 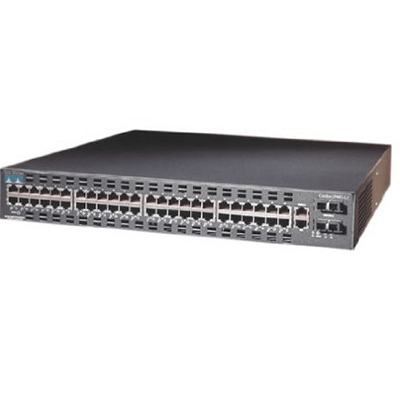 The CISCO CATALYST 3560G-48PS Series can provide a lower total cost of ownership (TCO) for deployments that incorporate Cisco IP phones, Cisco Aironet® wireless LAN (WLAN) access points, or any IEEE 802.3af-compliant end device. PoE removes the need for wall power to each PoE-enabled device and eliminates the cost for additional electrical cabling that would otherwise be necessary in IP phone and WLAN deployments. 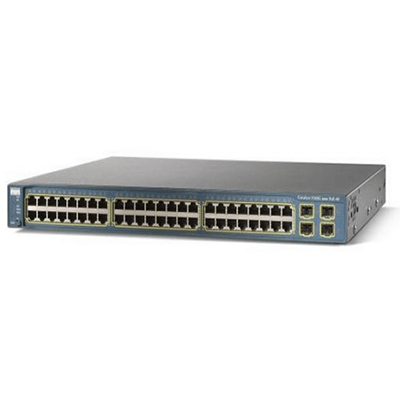 The CISCO CATALYST 3560G-48PSll-powered PoE ports at 15.4W for maximum powered-device support. 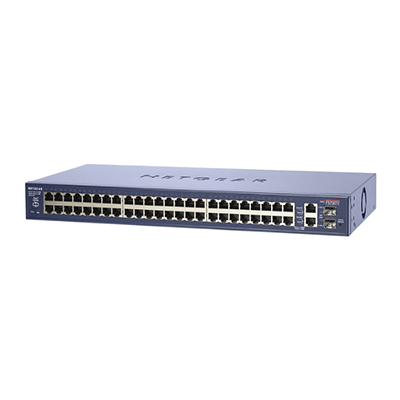 The Cisco Catalyst 3560 12-port PoE can support 8 ports at 15.4W or 12 ports at 10W or any combination in between. 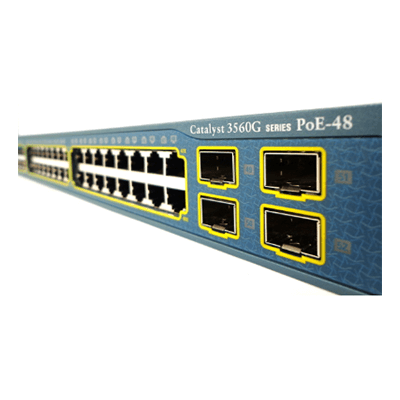 Taking advantage of Cisco Catalyst Intelligent Power Management, the 48-port PoE configurations can deliver the necessary power to support 24 ports at 15.4W, 48 ports at 7.7W, or any combination in between. Maximum power availability for a converged voice and data network is attainable when a Cisco Catalyst 3560 switch is combined with the Cisco RPS 2300 Redundant Power System for transparent protection against internal power supply failures and an uninterruptible power supply (UPS) system to safeguard against power outages. At speeds of 1000 Mbps, Gigabit Ethernet provides the bandwidth to meet new and evolving network demands, alleviate bottlenecks, and boost performance while increasing the return on existing infrastructure investments. Today’s workers are placing higher demands on networks, running multiple, concurrent applications. For example, a worker joins a team conference call through an IP videoconference, sends a 10-MB spreadsheet to meeting participants, broadcasts the latest marketing video for the team to evaluate, and queries the customer-relationship-management database for the latest real-time feedback. Meanwhile, a multigigabyte system backup starts in the background and the latest virus updates are delivered to the client. 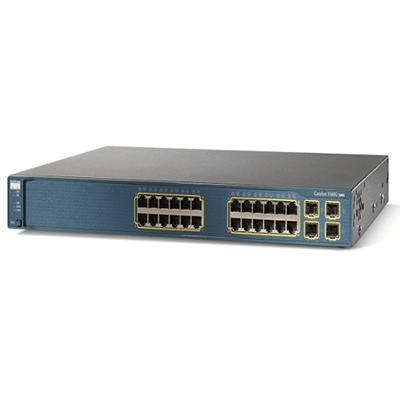 The CISCO CATALYST 3560G-48PS provides a means to intelligently scale the network beyond 100 Mbps over existing Category 5 copper cabling and simultaneously support PoE for maximum productivity and investment protection. These new demands are contending for resources with many existing mission-critical applications. As a result, IT professionals must view the edge of the network as critical to effectively manage the delivery of information and applications. As companies increasingly rely on networks as the strategic business infrastructure, it is more important than ever to help ensure their high availability, security, scalability, and control. By adding Cisco intelligent functions for LAN access, customers can now deploy networkwide intelligent services that consistently address these requirements from the desktop to the core and through the WAN. 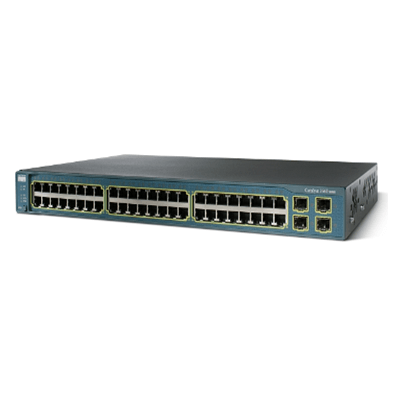 With Cisco Catalyst Intelligent Ethernet switches, Cisco Systems® helps enable companies to realize the full benefits of adding intelligent services into their networks. Deployment of capabilities that make the network infrastructure highly available to accommodate time-critical needs, scalable to accommodate growth, secure enough to protect confidential information, and capable of differentiating and controlling traffic flows is critical to further optimizing network operations. Cisco EnergyWise is an innovative architecture, added to the CISCO CATALYST 3560G-48PS switches, promoting companywide sustainability by reducing energy consumption across an entire corporate infrastructure and affecting more than 50 percent of global greenhouse gas emissions created by worldwide building infrastructure, a much greater effect than the 2 percent generated by the IT industry. Cisco EnergyWise enables companies to measure the power consumption of network infrastructure and network-attached devices and manage power consumption with specific policies, reducing power consumption to realize increased cost savings, potentially affecting any powered device. EnergyWise encompasses a highly intelligent network based approach to communicate messages that measure and control energy between network devices and endpoints. The network discovers Cisco EnergyWise manageable devices, monitors their power consumption, and takes action based on business rules to reduce power consumption. EnergyWise uses a unique domain-naming system to query and summarize information from large sets of devices, making it simpler than traditional network management capabilities. Cisco EnergyWise’s management interfaces allow facilities and network management applications to communicate with endpoints and each other using the network as a unifying fabric. 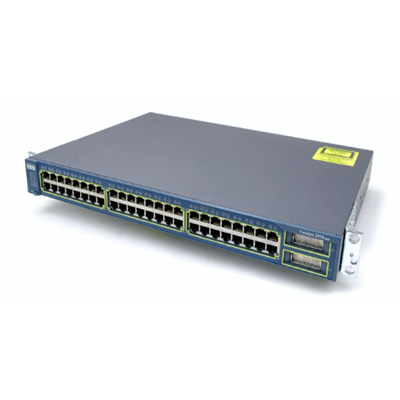 The management interface uses standard SNMP or SSL to integrate Cisco and third-party management systems. Cisco EnergyWise extends the network as a platform for power control plane for gathering, managing, and reducing power consumption of all devices, resulting in companywide optimized power delivery and reduced energy costs.